(CNN) -- Two-goal Steven Gerrard fired Liverpool back to the top of the Premier League -- for 24 hours at least -- with a 3-0 win at West Ham on Saturday. Liverpool skipper Gerrard led by example with two goals as his side returned to the top of the Premier League. 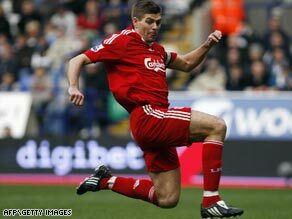 Rafael Benitez's side moved ahead of Manchester United on goal difference after England midfield star Gerrard helped them to victory at Upton Park. Fernando Torres made his return from injury and it took only 76 seconds for his partnership with Gerrard to carve their London rivals apart. The Spaniard expertly measured a through-ball for his captain, who rounded Robert Green to put the Reds ahead. Gerrard scored again seven minutes before the break, missing from the spot after Luis Boa Morte had tugged Torres' shirt but making no mistake with the follow-up. Substitute Ryan Babel completed the scoring six minutes from time. United, who have two games in hand over Liverpool, play Manchester City at Old Trafford on Sunday when Chelsea, in third, take on fourth-placed Arsenal. Liam Lawrence guaranteed Stoke's top flightsurvival with a stunning strike that hurled Hull closer to relegation after a 2-1 home defeat. Lawrence fired home from 25 yards with 18 minutes remaining at the KC Stadium to double Stoke's advantage after an earlier Ricardo Fuller effort. Andy Dawson replied with an injury-time free-kick but it was too late as Stoke held on to clamber to 42 points and safety. The result left fourth-from-bottom Hull with just two wins in 26 games since October and with their survival hopes depending largely on the form of their fellow strugglers. West Bromwich Albion gave their fans fresh hope that they can still beat the drop after an emphatic 3-1 home win over Wigan. The Baggies remain at the foot of the table but are now level on points in the relegation zone with Middlesbrough and Newcastle who meet on Monday. West Brom made a bright start and Marc-Antoine Fortune gave them the lead in the eighth minute, pouncing after Chris Kirkland could only parry a powerful effort from Gianni Zuiverloon. It was 1-1 within 10 minutes, Hugo Rodallega claiming his first goal in English football after his free-kick took a wicked deflection off Chris Brunt. But midfielder Brunt made amends on the hour, following up to score at the second time of asking after substitute keeper Richard Kingson had saved his initial penalty. Fortune wrapped up the win with just over a quarter of an hour remaining to set the home crowd dreaming of yet another great escape after the heroics of 2005. There was more good news for Tony Mowbray's side, who could have been relegated today if results had gone against them, as Hull were beaten 2-1 by Stoke at the KC Stadium. Sunderland, who are also fighting for their lives just outside the bottom three, dominated long periods of their dour goalles encounter with Bolton at the Reebok Stadium. Kieran Richardson was guilty of wasting Sunderland's best opportunity in the 24th minute, skying his shot from 12 yards, while Martin Fulop's late stop from Gary Cahill saved the Black Cats from a last-gasp defeat and leave them in 16th place, five points above the drop zone. Blackburn put an end to any lingering relegation fears with a 2-0 victory over Portsmouth, who will still be looking over their shoulder with two games to go. Morten Gamst Pedersen took advantage of an error by David James to put the hosts in front in the first half and Benni McCarthy settled the issue with a penalty on the hour. European hopefuls Fulham moved up to seventh spot after condemning Aston Villa to a 3-1 defeat at Craven Cottage. The hosts went ahead after six minutes when James Milner pushed Diomansy Kamara in the box and Danny Murphy slotted the resulting spot-kick into the bottom right-hand corner. Villa equalised on 15 minutes when PFA Young Player of the Year Ashley Young slid in to prod John Carew's cross past Mark Schwarzer. Fulham wrapped up the points early in the second half thanks to Diomansy Kamara who struck twice in the space of 10 second half minutes. Everton and Tottenham played out a goalles draw at Goodison Park.